Colin Meloy, perhaps most well known as the frontman for the hit indie band The Decemberists, has just released his first novel. The musician has always been a bibliophile* -- just listen to any one of his songs for proof -- and now he has taken that love to a new level. 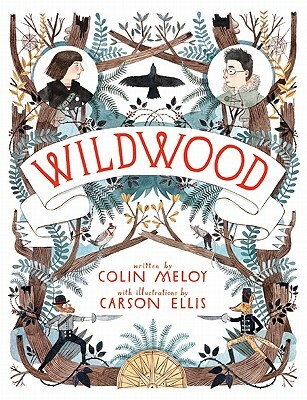 Wildwood, the first in a planned trilogy, is a 600-page YA novel, with illustrations provided by Meloy's wife, Carson Ellis. Clearly, I have to read this book. I love The Decemberists. I love artists trying out new things, new mediums, new adventures. I love fantasy novels. And the blurb has me thinking - or perhaps hoping? - that this could be the kind of YA novel that adults fall in love with, too. "Original and fresh yet steeped in classic fantasy"? Sign me up. "Warring creatures" and "peacable mystics"? Must. Read. What do you think? Will you read it? Any other lovers of The Decemberists out there? *For more about Meloy's love of literature, and how it has influenced his music, and how this book is clearly really awesome, check out Paste Magazine's review of Wildwood, which is the kind of well done contextual review I wish I wrote more of in my life. Being a shallow and unsophisticated reader (and music-listener, apparently...), I'm just going to point out how lovely the cover is. I mean, absolutely and truly lovely. There are even little Nutcracker-esque men! While cover alone obviously does not convince me to read a book, it's certainly enough to spark an investigation. Also: illustrated books? Totally awesome. I am not familiar with The Decemberists. This book looks interesting and I love the name Prue. Greg - They're just a fun group, I think! Fairday - They are an awesome indie rock band, if you like that kind of music. I like the name Prue, too, although it just reminds me of Charmed!